If you would have told me 10 years ago that one of my favorite foods would one day be brussels sprouts, I would have laughed at you. But now that I've figured out the most delicious way to prepare them, I eat them all the time. This recipe takes less than 15 minutes to throw together and is unbelievably easy to do. And you really can't go wrong with the maple Bacon flavor combination. 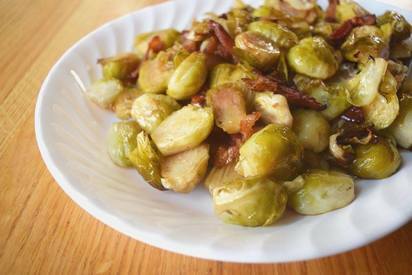 While cooking, the maple syrup caramelizes the sprouts and the Bacon ever so slightly and creates a salty, sweet combination that I can't get enough of. Trust me when I say you'll be making this recipe over and over again.